Meet George, originally uploaded by VeroC. B and I went for a Mommy & Me walk. We passed many interesting things along our way, but my boy stopped at one point & shouted (shouted!) "It’s a smiley face!!" 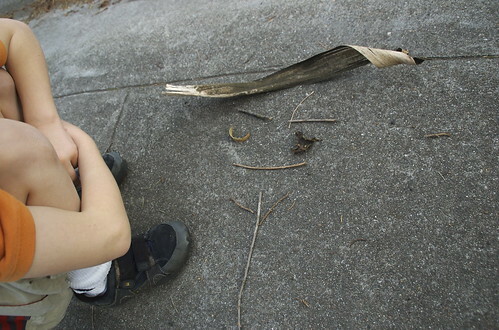 He then proceeded to give the face some eyebrows, a nose, a body… When we came back the next day his creation had been blown away by the wind so he painstakingly re-created his guy.